The novelty of pooing in a bucket wore off sooner than I had imagined . I’d rather hoped that the entertainment factor would see me through at least a few weeks but in fact it was less short lived than that, a matter of hours and already I was fed up having to use a bucket. Little did I know that it would be mid December before the toilet was finally installed and I could reign supreme on my porcelain throne once more – the bucket was to remain a feature of our lives for almost 8 weeks. The bliss we both felt when the toilet was finally plumbed in was indescribable. And not just a toilet but a bidet, a shower, a washing machine and HOT water! And following on from the excitement of being able to wash in hot water and sit on a loo, was the joy of having a kitchen. 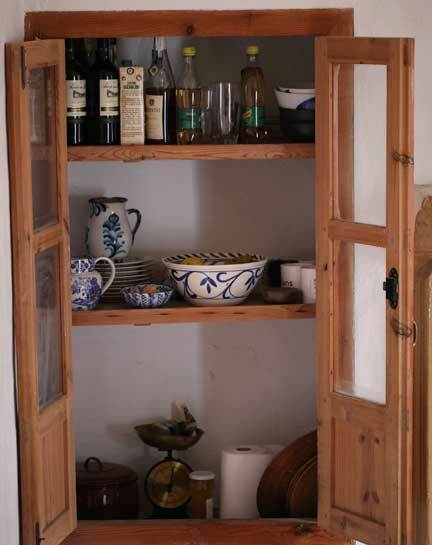 For weeks I’d been washing the dishes outside in the yard and cooking in whichever room was least full of rubble but now at last I had a proper, Spanish cocina. Things at that point were really starting to look up until; we had news from the shipping company. The Spanish port authorities at Algeciras were not happy with our Indonesian paperwork. They insisted that we get a form signed and rubber stamped by the Indonesian Embassy in Madrid. They also wanted over $1,500 extra to be paid for the shipment of our household goods from Jakarta and transport costs up to Granada. This was not a happy situation. Both Irishman and I were devastated as we’d been planning on spending the last of our savings on going back to London and be with the children for Christmas, now with these extra costs we could no longer afford to go. I felt quite blue around this time. Even the sound of flushing toilet couldn’t raise a smile out of me and for a while I wondered if we’d been quite mad to think that we could live solely on Irishman’s teaching pension. At least we’d got phase one of the building works done, the rest would now have to wait until we’d sold our house back in the UK. But having to tell the children that we wouldn’t be able to see them at Christmas nor be able to buy them any presents was miserable. I’m not sure if this applies to all of Spain or if it is just here in olive growing country but Christmas is not really celebrated here certainly not in the way that it is the UK. In fact if it wasn’t for the fact that half way through December the local council put up a string of lights across the village street boldly wishing the village ‘Feliz Navidad’ you’d be forgiven for thinking it was just like any other time of the year. Of course Christmas comes at the height of the olive harvest and since both men and women work at the harvest, it leaves very little time for anything else. New Year’s Eve however is a big occasion and one that we felt hugely honoured to be included in by our neighbours, Paco and Antonia. Truth be told, I’ve never been a huge NYE fan, in fact most years I’m tucked up in bed by 10pm with a book (and glass of cava, well it would be churlish not too). But this year things were a little different. A very glamorous Antonia pitched up on our doorstep on the morning of the 31st December with a hand written invitation to have dinner with the family that evening. ‘See you at 9pm’ 9pm? Hell, that was very nearly my NYE bedtime what was I going to do? Irishman had been working on a painting for Paco’s 50th birthday and we decided that it would be nice to give it to him that evening. Paco was very happy with the painting of his cortijo and we felt very touched to have been invited to join in the family’s New Year celebrations. Antonia’s five course meal was delicious, and we were having such a good time that it seemed like no time had passed at all before Irishman and I were taking part in the Spanish custom of eating one grape at every stroke of the clock at midnight. You never know, the novelty of eating 12 grapes at midnight, could turn me in to a fan of New Year’s Eve after all. I am sure that there is an Agatha Christie book called Twelve Grapes at Midnight in which the aged Spanish parent is quietly fed grapes injected with cyanide by his grasping son. Happy New Year, padre. I think you could have tried them on the port authorities in Algeciras. Miserable bastards. Still, who could not be happy with a new bathroom suite in which you can poo and watch the clothes tumble round at the same time. Luxury indeed. 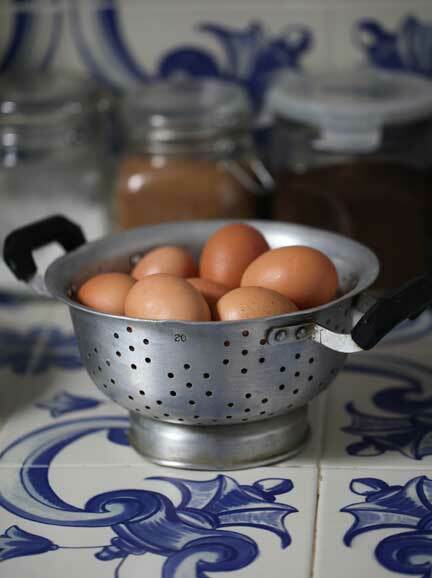 I do like the old colander. We had one just like that. None of this plastic rubbish. Ideal for putting on the child’s head when school play comes round too. Of course it looks just like a soldier’s helmet, Andy. I don’t know why the other children think it doesn’t. (I vividly remember the conversation). I think The Twelve Grapes was made into a film starring Margaret Rutherford as Miss Marple. In Red & White in honour of the grapes. Check it out on Google. Go on. You know you want to. Just in case there is a 0.0001% chance it might be true. but they DO look like soldier’s hats, Andrew! What a wicked idea for a plot, the 12 grapes injected with cyanide – erm, not sure about the film though….yer ‘avin a giraffe wiv me, ain’t yer! The shippers and the customs were all miserable bastards 😛 if we ever do a big move again, I’m leaving everything behind. It will save us a small fortune and much less stress. Plenty of fermented grapes consumed but the midnight grapes were unfermented. I agree with you about the bureaucracy, making us go all the way up to Madrid just to get something signed and stamped was lunacy! I have found if you buy the tinned grapes they are easier to get down… I am afraid I would not be willing to use a bucket :-0 like my comforts these days! I remember hovering over a public loo in Parish wasting my cheque chits. Where is water, where is the soap, where is the soap? What a lovely tale and set of photos. Your sense of beauty coming out in the portrayal of those lovely ingredients and kitchen utensils. NYE is overrated, a typical modern invention to encourage consumption and fatten business empires, and the Spanish know it. How nice to get the invitation to Paco’s family. A bidet? I’ll have to think about that one. Gerard, I can’t believe that you don’t have a bidet, I thought that they are very dutch, a bit like those weird toilets with the shelf which used to fascinate me when I was a kid. The NYE invite was such a kind thought, it made a rather bleak end of year, much, much better. I’m so pleased you got your bathroom finally with all it’s exciting facilities like a flushable loo and hot water. I’m devastated at the port authorities charging you again for something you’d already paid for. What a bunch of Christmas miseries. Such a shame it messed up all your plans for a visit home to see the children. Things will pick up now though, no more disasters. It was exciting, very exciting. I’m not quite the happy camper that I thought I was. I think the final indignity was when the bucket collapsed with me on top of it – you don’t need much imagination to figure out the mess. Mr Crapper changed people’s lives! Yahoo two Andalusian posts on a week. When we are deprived of any of our modern comforts it really makes us appreciative when they are reinstated. Especially the stately throne. Your collapse brings new meaning to the Game of Thrones. I love the blue tiles and kitchen colours. Nice photo of the big guy looking wistful. Sorry you missed the Chtistmas time with your family. But the NYE family party sounded lovely. You two sure have courage and it is paying you dividends. I know, 2 posts in as many days, it’s like waiting for London buses, nothing and then 2 roll up at the same time! Drat, Game of Thrones, that’s what I should have called this post – wake up, Lottie! I loved reading your words but I can only say it was not a joy to read how the Spanish authorities took your money needlessly. For all anyone knows that money probably went some other place. The blue tiles and kitchen utensils look to be an invitation to cook. 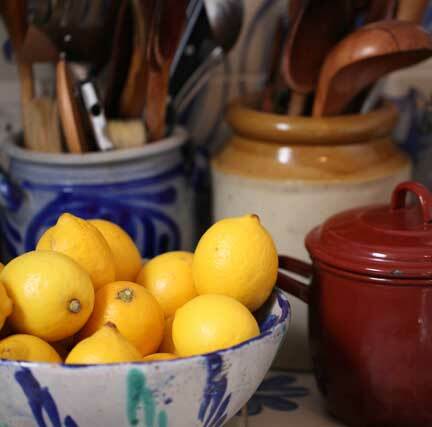 I find your mom’s kitchen wares beautiful and endearing. I have a one old brownstone pot that belonged to my MIL but it is kept on a shelf. The pic of Irishman watching the logs burn in the fireplace evokes memories of when I used to stare at the fire as I mused about all things sad in my life. Another question for you. 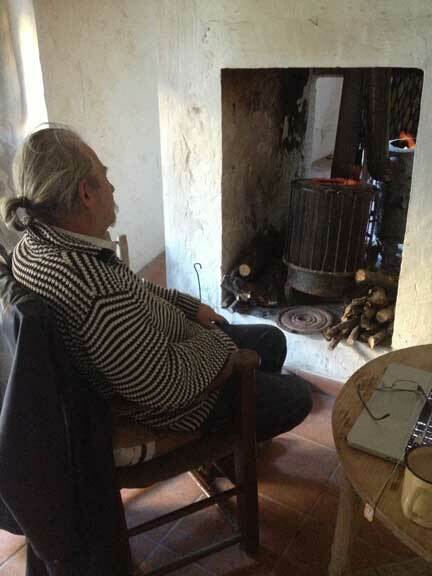 Is the fireplace wood, from the prunned olive trees? I’ve got to admit, I did think of you on occasion when plonked down on the bucket, I thought, if Yvonne used to have to do this, so can I! Yes, the firewood is olive and there is also cherry which is cheaper to buy but burns faster. We were very fortunate because a huge store of logs was left for us so we’ve not needed to buy any wood this winter. Hola a Paco y Antonia tambien! Pooing in a bucket for eight weeks? You are of sturdy material, Lottie. Glad you finally have a throne and you have a kitchen that looks absolutely homey and welcoming. Aww, thank you! It is a HUGE relief on all counts having my throne back. The kitchen is sweet, tiny but lovely. It is very traditional and outside the house – fine in the warmer months but freezing in the winter, especially when I am running to and fro with plates and food in to the house and the rain is coming down…..
Now that Spring is here we practically live outside, the next big project aside from fixing the holes in the roof, is to ‘beautify’ the courtyard. I’ve got a fancy for copying the famous Cordoba courtyards with lots of wall pots and tiles. irishman better start selling some paintings!! I can just imagine the relief of getting a toilet after eight weeks. We used portaloos at the last camp site (must post soon), but the bucket doesn’t sound joyous. 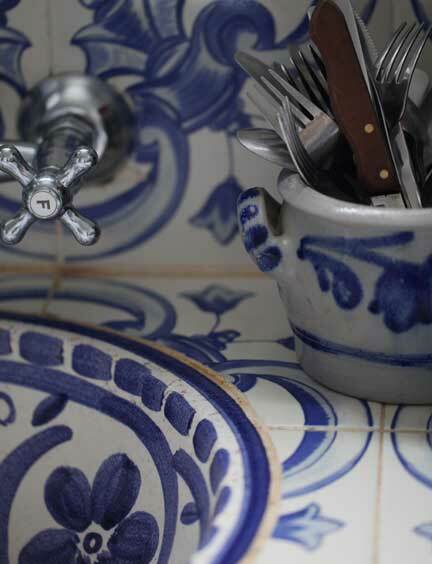 I love all of the kitchen blue and white, tiles and crockery. You’re braver than I am. I thought life was rough when I had to take army showers (and not more often than every other day), and use the toilet sparingly (if it’s yellow, let it mellow; if it’s brown, flush it down…) for 3 months because our well was running dry. I really can sympathise with you. I hated having to make do with strip washes, I felt really filthy for weeks – it kind of makes my skin crawl just thinking about it. We are lucky in that we have mains water here and a well. The village also has a spring and the water is free for everyone, it tastes much nicer than the water out of the tap. I hope your well is full again now, it’s a worry having to think about every drop of water – it is something that we tend to take for granted, like toilets and showers! It was quite a while ago–and when we dug a new well, we got a gusher of wonderful-tasting mountain spring water. It did, however, serve to remind me of what a precious commodity water is, and to this day, I’m much more reserved and careful with it. Wow, I was just relating to someone your story about finding a house in 3 days, and then trying to hide the bucket in the car w/o your husband seeing it! So funny. That last photo is gorgeous! Was it an early morning shot? I like the idea of marking each hour with a grape. Although I prefer the seedless reds, it would be fun to mark each hour by spitting a seed into an acoustically proper metal pot. Like you, I never see the hour of the New Year. No different than any other night for us. I’m pretty jaded and would just have my grapes at 9 and then off to bed. January 1 often yields some splendid ice photographs and the occasional sunrise. As a child I’d stay up but those days are ancient at this point. 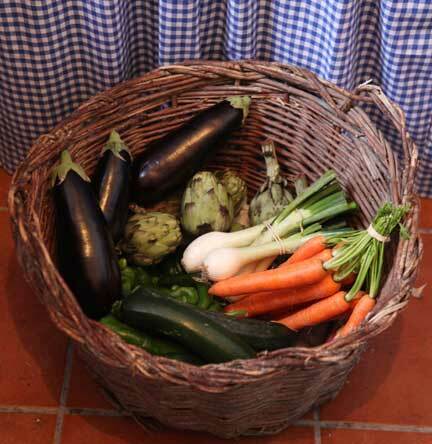 I am a fan of blue and white tiles and the fruit and veggies look to be quite ripe and prime. Thanks, Steve. I’m glad I’m not the only one who slopes off to bed early on NYE. I like your acoustic idea, that’s cool – I believe that there is an olive spitting competition in these parts, I need to check it out. 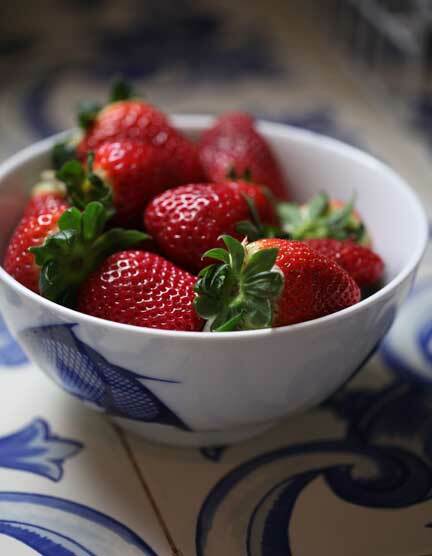 We are spoilt with good fruit and veg here – this area of Spain, especially down on the coast grows a lot of exotic fruit, papaya, mangoes and avocados. It’s harder to find ‘winter root’ veg like celeriac and turnips, suede and parnips, I guess they are more of a northern european thing. 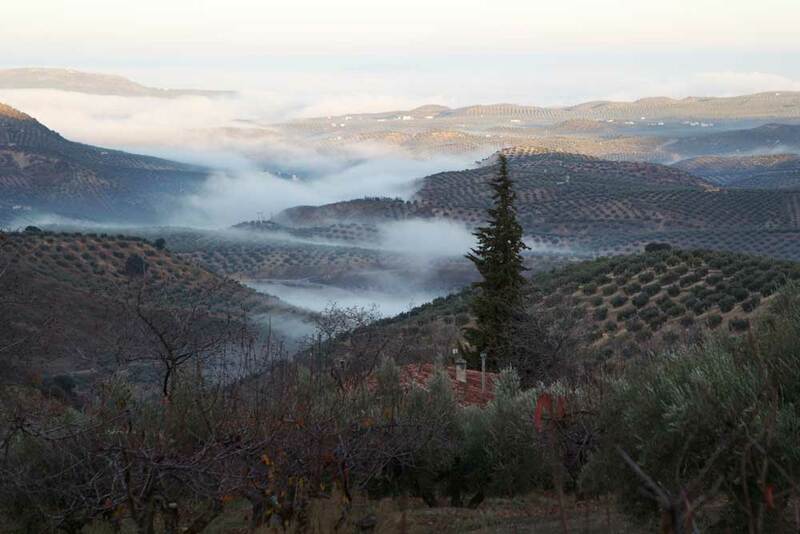 Aside from olives, cherries are the next crop to be harvested here in the village. Needless to say I’m excited about that! The weather is now bliss – we eat breakfast, lunch and supper outside and the yard has become our new sitting room. The fig tree gives us shade and apart from the plague of caterpillars that have eaten ALL my plants, it’s pretty perfect. ooohh!!! Cherries!!! I love ’em. They almost killed me as a child though. My cousin climbed his cherry tree when I was 7 or so and started tossing them down to me. I didn’t stop. Fever quite high and very sick. I survived though and can’t get enough of them to this day…but I have learned restraint. We are not yet seeing much green here, but it should explode shortly judging by the non-stop rain we’ve been having. Love the kitchen! I thought twelve grapes was the name of a wine…are you sure it isn’t? I mean, it was NYE after all, things may have been a little fuzzy-wuzzy? 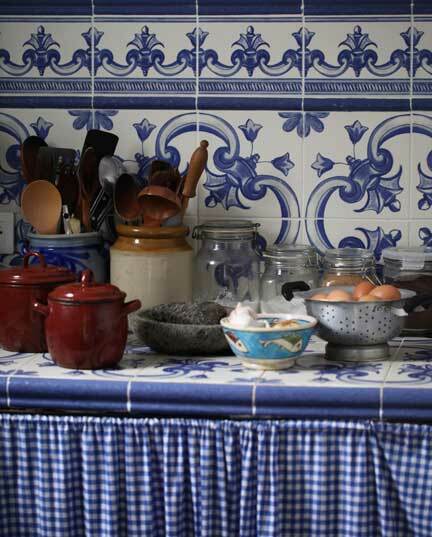 Beautiful tiles, my mum would commend your good taste – her home in Portugal is adorned top to bottom with traditional blue and white ceramic. My Auntie from Barcelona (feel like Manuel from Fawlty Towers) passed on the grape custom to us, difference is she eats sultanas or raisins. We follow this custom religiously every NYE and then I go to bed- Trafalgar Square, cider, embracing strangers and hugging police officers looooong gone! I think the sultana idea is the best yet, much easier to get down and delicious to boot. I could have spent a small fortune on tiles, but we had to go for something cheap. These are mass produced but I quite like the overall effect of them and they jolly the place up. I found a tile shop just outside Granada that made me almost pee my pants with excitement, the hand-painted tiles were exquisite but at almost 2€ a pop, out of the question. Roll on lottery win!! What a resilient pair you are – a bucket for eight weeks – and the upset of your Christmas plans. But it would appear you have a lovely, lovely home in the making. Great news about the house sale, L. An exciting phase ahead! How was the 24 hour ferry ride? love this post, shitting in a bucket for that time, i like squatting in the woods …. did a lot of it in bali when i had the runs… post some of Irishmen’s art work, would love to see it …. that was steep , the 1500… things are working out .. Spain is blessed with your company and Holland isnt’ far away! The ferry is a 2 night job so a long trip and quite boring. I do a lot of people watching and read. BUT, this time on the crossing over I saw 2 whales! Dolphins often pop up alongside the boat but whales, I could hardly contain my excitement! I”d love a medal, seeing those dolphins what a bonus!